The new 2019 Nissan Maxima is the ideal combination of exhilarating performance features and sleek style. When you get behind the wheel of this new 4-Door Sports Car®, you’ll be amazed by the 2019 Maxima engine power as you zip through the streets of Geneva. And with the seamless integration of advanced Nissan Maxima interior and safety technologies, you’ll enjoy a truly modern driving experience. Stop by our Nissan dealership near Geneva, IL, for the latest information on the 2019 Nissan Maxima release date and our new 2019 Maxima prices! 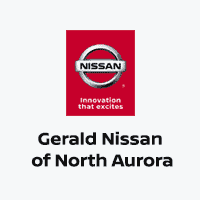 Contact Gerald Nissan of North Aurora to be among the first to know about the new 2019 Nissan Maxima arrival and schedule a new 2019 Maxima test-drive!